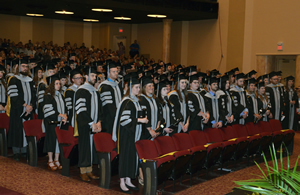 MU’s College of Veterinary Medicine graduated its 68th class – 112 newly minted veterinarians – during the college’s 2017 Academic Convocation on Friday, May 12, at Jesse Auditorium. The occasion was more celebratory than solemn, with frequent interjections of humor by Dean Neil Olson, keynote speaker Ron Cott, and Tim DelValle, who gave the response on behalf of the graduating class. 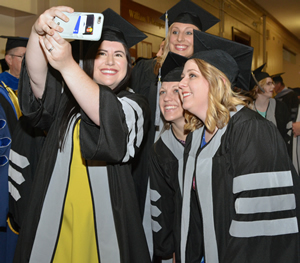 MU CVM students stop for a selfie before the start of graduation ceremonies May 12, 2017. Olson, DVM, PhD, highlighted students’ activities and accomplishments outside of their rigorous academic and clinical requirements. The MU College of Veterinary Medicine Class of 2017 prepares to the take the Veterinarian’s Oath. Clifford Miller, DVM, president of the Missouri Veterinary Medical Association and a member of the CVM Class of 2000, administered the Veterinarian’s Oath to the new graduates. Keynote speaker Cott, DVM, retired as associate dean for Student and Alumni Affairs and executive director of Advancement for the CVM. He has been honored as the Missouri Veterinary Medical Association Veterinarian of the Year, the Robert E. Hertzog Leadership Award recipient, CVM Alumnus of the Year, and a recipient of the university’s Gold Chalk Award and Excellence in Education Award. He also has a reputation as a storyteller. 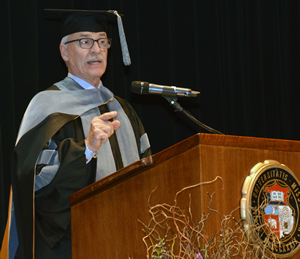 Ron Cott, DVM, a member of the MU CVM Class of 1973 and recently retired as associate dean for Student and Alumni Affairs and executive director of Advancement for the CVM, offered the keynote address. Cott’s remarks consisted mainly of two stories and two parables, which were met with laughter and applause. Cott emphasized to the graduates that, after four years of focusing on all things animal, their success as veterinarians depends greatly on people skills. After recognizing the interns and residents who are completing specialty training at the CVM, Olson announced he was going “to go off script in a way we’ve never done” because “there is one individual here today whom we have decided to honor in a special way.” Professor Emeritus William Fales, PhD, MS, is a bacteriologist by trade. He is the only non-veterinarian inducted to the MVMA Honor Roll, the only non-DVM to be an active voting member of the MVMA, and an honorary member in the Missouri Academy of Veterinary Practice. In recognition of his 40 years of service to the CVM and the veterinary industry, Olson named Fales the first Honorary Veterinarian in the college’s history. 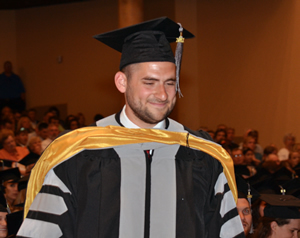 Fales’ daughter, Amanda Fales-Williams, DVM, assisted with his honorary hooding ceremony. Timothy DelValle heads to the podium to offer the response on behalf of the CVM Class of 2017. 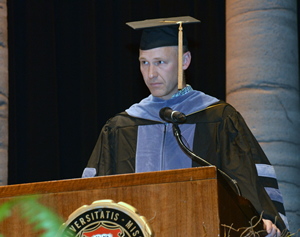 Clifford Miller, DVM, president of the Missouri Veterinary Medical Association and a member of the CVM class of 2000, administered the Veterinarian’s Oath to the new graduates. Then, Associate Dean for Student Affairs Angela Tennison, DVM, announced the name of each graduate, who crossed the stage to receive the distinctive black and gray hood that signifies completion of the doctor of veterinary medicine degree requirements. Dean Olson — assisted by Fales, Vice President of University Relations Steve Knorr, and Interim Chancellor and Provost Garnett Stokes — distributed diplomas to the graduates. Graduates were hooded by Associate Dean for Academic Affairs Linda Berent, DVM, PhD, and Timothy Evans, associate professor in veterinary pathobiology. Evans, DVM, MS, PhD — known for his Hawaiian shirts and effervescent enthusiasm — was selected by students to assist in the hooding ceremony. Stokes, representing the Board of Curators, conferred degrees to the class, and Olson advised the graduates they could “move your tassel from the right side of your hat to the left, to indicate that your degree has been conferred,” as he announced “the world’s newest veterinarians” to the crowded auditorium. Since its first graduating class in 1950, the CVM has produced nearly 4,000 doctors of veterinary medicine. A photo gallery from the graduation ceremony can be found on the CVM Facebook page.